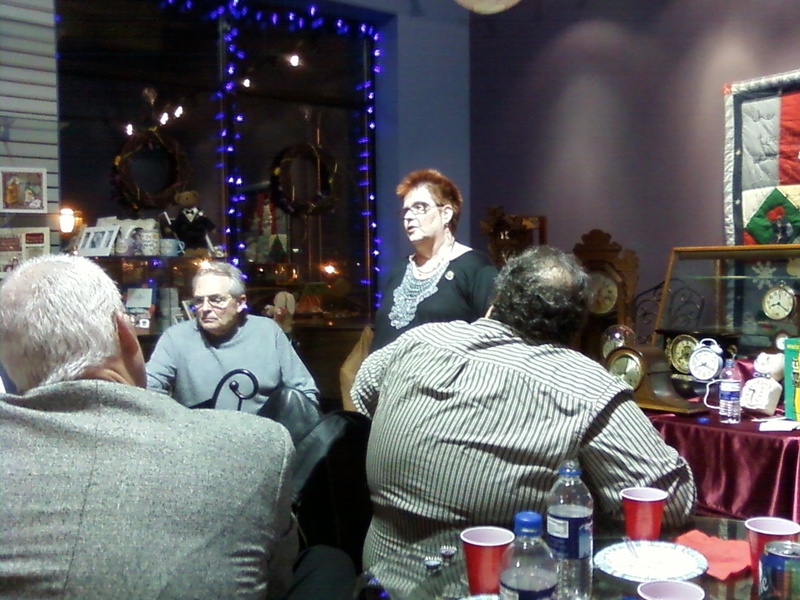 Tonight I was at the Author book signing at Martha Merrells for the book The Home for Wayward Clocks, by Kathie Giorgio. It is Kathie's (pictured above) first novel and the place was packed with what I would say was 50+ people. The signing was preceeded by a catered dinner (which I had to miss) and a short presentation by the owner of Little Swiss Clock Shop. She gave a brief history of a number of clocks that they had on display on a table in the bookstore. It was fascinating to hear some of the history and specifics of the wide variety of clocks that were there. There was a large Mantle Clock that I recognized as one that my grandmother had in her apartment. It was a beautiful timepiece and served as the "graveyard clock" in Kathie's book. She also had on display a knock-off Felix Clock that was an electric clock of a cat whose eyes and tail moved in synchronicity. A classic piece of 60's Americana, amongst the "old dependables" that were chiming and gonging through the night. The chiming and gonging actually made the evening more enjoyable. If nothing else, it added a relevant ambiance. After a short history of what went into reading the book, Kathie read a chapter from it. It was a chapter that furthered the relationship between James (the clock keeper) and Cooley (the rebellious teen). She did a great job and interjected points of interest asides when necessary. Judging from the raucous applause at the end, people were entertained and excited about the book. Kathie then took some questions and signed books for those interested. It was an entertaining evening among peers and friends for me. It made me dream of the day when I might be in the same position; hosting a signing of a book. I can't imagine the thrill of having something I've put my heart and soul into being pitched at such an event. It may be two years out, it may be twenty, but it's certainly on my bucket list. Maybe the BWCA memoir is it (I hope it is...) maybe not.